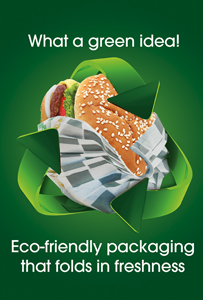 Founded in 1990, GreenDustries offers environmentally friendly packaging to fast food restaurants. Our simple concept of packaging offers convenience to consumers who are on the go. Our packages are designed to use less space, as well as prevent a messy experience when a person enjoys their sandwich on the go. Our ethical and responsible practices, like using 100% post industrial/pre-consumer recycled paper, are at the forefront of the packaging industry leaving a positive carbon footprint behind. Our Mission: To be a multi-national packaging company which develops and manufactures innovative consumer packaging which is cost competitive, practical and environmentally responsible. Awards: Performance Innovation Award by the Foodservice Packaging Institute 2010. Our Products:The PleatPak™ for Sandwiches | The Magic Bag™ for French Fries and Finger Foods. I just choose to notify you that I’m really new to blogging and actually savored you are site. Probably I’m very likely to bookmark your web site . You undoubtedly feature fantastic content. Thanks a bunch for sharing with us your webpage. Very nice style and design and good written content , hardly anything else we require : D.
I’m often to blogging and i actually admire your content. The article has actually peaks my interest. I am going to bookmark your web site and maintain checking for brand new information. I am Angel A. Tuason, a businessman from the Philippines. I am interested to become the exclusive distributor of your products particularly pleatpak, magic bag, and the rest of your innovative product line in the Philippines and the Asean countries. My access to quick service restaurants – Jollibee, McDonald’s, Wendy’s and others will enable me to generate immediate market penetration. A successful market launch in the Philippines will serve as a platform to introduce your innovative packaging to our neighboring countries where local market leader Jollibee has enjoyed patronage through the years. Please consider the Philippines as jumping point to cover the Asean market for Greendustries. I am looking forward to an immediate response from you. I am excited to forge an anticipated highly successful business partnership with Greendustries oonest. Thank you very much. Great stuff here, I will get back to read more! I just want to say I’m new to blogging and certainly enjoyed this website. More than likely I’m want to bookmark your website . You amazingly have terrific article content. Thank you for sharing your blog. Excellent post. I was checking constantly this blog and I am impressed! Very helpful info specifically the last part 🙂 I care for such info much. I was seeking this certain info for a long time. Thank you and best of luck. Very cool website! Thank you for taking the time to generate this useful blog post! Greeting from over the world. excellent blog I shall return for more. Really fascinating site! Thanks for taking the time to compose this appealing post! Thank your interest in our products. I have forwarded your message to the sails department.They should get in touch with you shortly. Hi, you have a good looking shop!Hope you will have a great blog….You can get great templates @Wordpress.org.